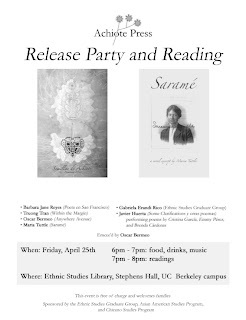 Achiote Press will celebrate the release of our Spring issues with a party on Friday, April 25th at the Ethnic Studies Library on the UC Berkeley campus. The event will feature special readings by former Achiote contributors Barbara Jane Reyes (Poeta en San Francisco) Truong Tran (Within The Margin), and Oscar Bermeo (Anywhere Avenue). Maria Tuttle will read from her new Achiote chapbook, Saramé. This chapbook contains an excerpt from Tuttle's historical novel about the life of a woman in El Paso, Texas during the early 20th century. Gabriela Erandi Rico will read from her contributions to the new Achiote Seeds chapjournal. Javier Huerta, author of Some Clarifications y otras poemas, will perform selections from the other contributors to the journal: Cristina García, Emmy Pérez and Brenda Cárdenas. Poet Oscar Bermeo will emcee the night. We'll have food, drinks and music. The event is free, open to the public and we welcome families and children. 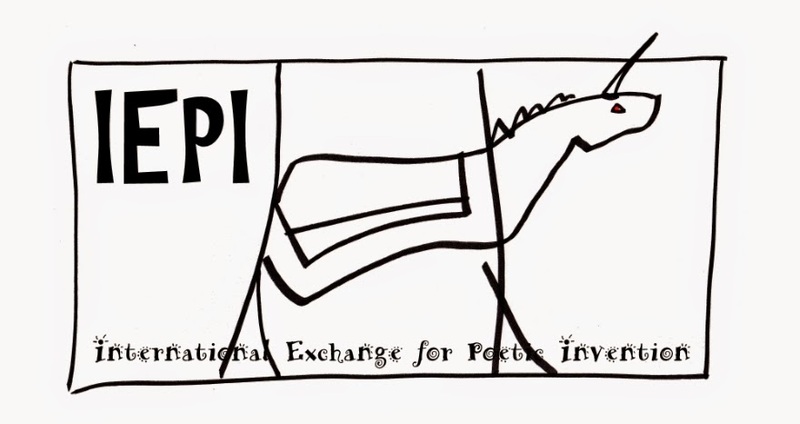 Sponsored by the Ethnic Studies Graduate Group, Asian American Studies Program, and Chicano Studies Program.